There’s certainly no shortage of real time strategy games on the PC and Warlords Battlecry 2 is yet another excellent example of the genre. Playing as one of twelve races in the game, you must conquer no less than sixty seven different regions. To spice things up a little, one of your units is a “Hero” who can also go on quests while the carnage unfurls around him or her. Well received by critics and gamers alike when first released, this fantasy RTS game has aged well and is crying out for gamers to give it a second look. Warlords Battlecry 2 should install without any major issues, simply insert the game disc into your computers optical drive and follow all on-screen prompts. When asked which type of installation to perform, we recommend you choose “Custom” and then install all available components to your hard drive. This will result in the smoothest possible gameplay. Before playing the game, you should install patch 1.04. Although this is listed as a beta patch, we still recommend it. You can download the patch here. Simply double click on the patch once it is downloaded and follow the on-screen prompts to install it. With the patch installed, there’s one more step you should take before staring the game. Find the “Play Warlords Battlecry II” shortcut on your Start menu or Start screen and set the compatibility mode options to run the game in compatibility mode for Windows XP (Service pack 2). If you don’t do this, the game will start, but all the units on the battlefield will be invisible. Visit this page if you need a tutorial on how to use compatibility options. With that set, you can go ahead and launch the game for the first time and check that everything appears to be working. Before you start playing there are a few options you might want to set first. Barbarians are my favourite race in the game, because the hero’s voice sounds like the worst Arnie impersonation ever. To set the games visual quality options, click on “Options” from the games main menu and then click on “Graphics”. First of all, choose a suitable resolution for your system. Warlords Battlecry 2 is a 4:3 aspect ratio (non-widescreen) game and will only run in 4:3 screen modes. Choose the highest resolution you can comfortably read the games text at. 1280×1024 should be fine for a desktop monitor but you may need to go lower if you’re playing from your couch. All other settings can be changed to “On” or “Maximum”, with the exception of “Gamma Correction” which affects screen brightness and can be set to taste. Remember to click on the thumbs up icon to save your changes. 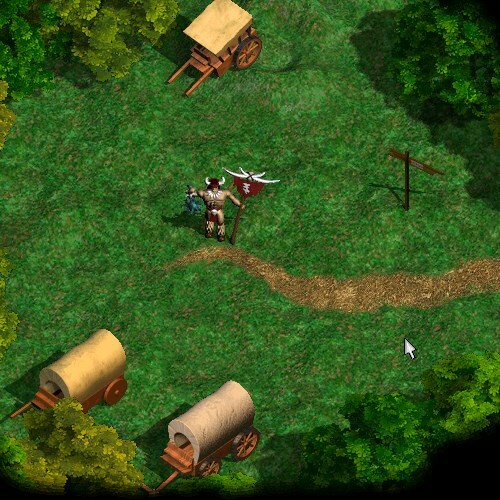 Like many games from this era, Warlords Battlecry 2 supports the now defunct EAX sound system in order to deliver enhanced sound effects in-game. If you have an EAX capable sound card in your system, you can use the Creative ALchemy software to restore EAX capability to this game in modern versions of Windows. Simply exit the game and start the ALchemy tool. On the main ALchemy window, click on “Add”. 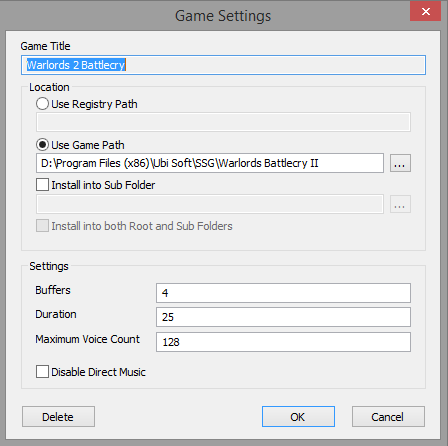 Enter the name of the game in the Game Title box (Warlords Battlecry 2) and then choose the “Use Game Path” option and browse to the Warlords Battlecry 2 game folder (C:\Program Files (x86)\Ubi Soft\SSG\Warlords Battlecry II by default). Leave all the other options as the defaults and click on “OK”. Finally, choose “Warlords Battlecry 2” from the list on the left of the window and click on the “>>” button. The game should now appear on the list of “ALchemy-enabled Games” on the right. With ALchemy enabled, start the game and choose “Options” from the main menu. Click on “Sound” and if you did everything correctly you will now be able to enable EAX support. Warlords Battlecry 2 has extensive multiplayer options. The match-making servers originally run by the publisher, Ubisoft, have long since shut down. However, by using the TCP/IP option it is possible to connect to opponents on the local network or, by using a tool like Tunngle, to opponents over the internet. We have not tested the games multiplayer modes so please leave a comment if you still play this game online or over a LAN. Game units are invisible – If you cannot see any units on the battlefield, make sure that you set the game to run in compatibility mode for Windows XP (Service Pack 2). If that still doesn’t help, try running the game in a lower screen resolution. Game scrolls too fast – On modern PCs the default scroll speed is too high, making it difficult to move around the map. You can change the scroll speed in the Gameplay options menu under “Scrollrate”. You can also use the arrow keys on the keyboard to move around the map more precisely. Problems saving games or settings – Like many older games, Warlords Battlecry 2 places its save game files and various configuration files in the same directory that it is installed to. This can cause problems on more modern versions of Windows as programs are not normally permitted to write to the program files directory. To avoid this problem, either install the game to an alternate location (e.g c:\Games\Warlords Battlecry II) or manually edit the permissions on the Warlords Battlecry II folder. A tutorial on how to do this can be found here. This game doesn’t seem to work online over hamachi, or tunngle. The game works online using GameRanger though it does crash once in a while. The game was crashing for me too, but I reduced the resolution and it worked fine for me. I dont know whats going on with this game of mines. WBC 2, I can not get it to work properly. It’ll load up all the way to game play, but i see no units at all. Nothing but terrain & music. You set the compatibility mode as per the guide?